21 July 1910: born in Ôsaka in the district of Minami-Ku. May 1916: adopted son of Nakamura Fukusuke IV, he makes his first stage appearance (hatsubutai) at the Nakaza, where he received the name of Nakamura Masajirô III. January 1935: Nakamura Fukusuke IV and Nakamura Masajirô III respectively take the names of Nakamura Baigyoku III and Nakamura Fukusuke V in Ôsaka at the Nakaza; the new Fukusuke plays the role of the yakko Yatahei in the drama "Ishida no Tsubone". 1936: Fukusuke moves to the Tôhô Kabuki troupe, a competitor of the Shôchiku Company. 1940: Fukusuke moves back to the Shôchiku Company. February 1948: Fukusuke plays at the Ôsaka Kabukiza the roles of Sagisaka Bannai and Genroku in the classic "Kanadehon Chûshingura"; his adoptive father appears on stage for the last time, playing the role of Honzô's wife Tonase. 18 March 1948: his adoptive father Nakamura Baigyoku III dies. July 1953: revival at the Meijiza of Kawatake Shinshichi III's 1878 drama "Tsûzoku Saiyûki"; Fukusuke plays the role of Sagojô [casting]. 1954: Fukusuke joins the troupe led by Nakamura Kichiemon I.
February 1955: Izumi Kyôka's drama "Tenshu Monogatari" is staged for the first time with Kabuki actors, at the Kabukiza; Fukusuke plays the role of Shu-no-Banbô [casting]. 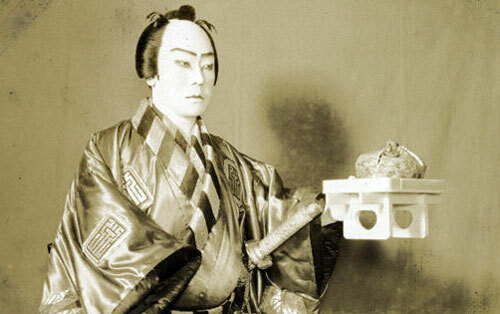 March 1956: premiere in Kabuki at the Meijiza of Hôjô Hideji's drama "Ii Tairô"; Fukusuke plays the role of Nakaizumi Ukyô [more details]. July 1956: revival at the Kabukiza of Tsuruya Nanboku IV's drama "Sumidagawa Hana no Goshozome", commonly called "Onna Seigen"; Fukusuke plays the role of the yakko Sudahei [more details]. April 1960: premiere at the Kabukiza of Hagiwara Yukio's dance-drama "Onizoroi Momijigari"; Fukusuke plays the role of the shitennô Ueda Tarô Yoshiharu [casting]. November 1962: revival at the Kabukiza of the drama "Fudô", which belongs to the Kabuki Jûhachiban; Fukusuke plays the role of one of Hayakumo's retainers [more details]. June 1963: Namiki Shôzô I's drama "Yadonashi Danshichi Shigure no Karakasa" is produced for the first time at the Kabukiza; Fukusuke plays the role of Manriki Ichiemon [casting]. January 1965: premiere at the Nakaza of the spectacular hengemono "Ôtsue Dôjôji"; Fukusuke plays the role of Ya-no-Ne no Gorô [more details]. January 1967: revival at the National Theatre of "Narukami Fudô Kitayama Zakura"; Fukusuke plays the role of the karô Yatsurugi Genba [casting]. April 1967: Fukusuke appears on stage for the last time, in Tôkyô at the National Theatre, where he plays the roles of Senoo Tarô and Asaka Ichinoshin in "Shunkan" and "Yari no Gonza". 1 January 1969: Fukusuke dies. Nakamura Fukusuke V was was a talented supporting tachiyaku actor and a mainstay for a surviving Kamigata Kabuki, who excelled in katakiyaku roles performed in an old-fashioned style. He was one of the seven actors who created the Shichinin no Kai.